We have a used 5 Square Meter Diatomaceous Earth Filter for sale. We also have original schematics for it. I have a 40x40 Latina plate and frame filter for sale, only used a couple of times. In perfect condition. Please email or call if interested or for more details. New, never used 2" US--Flexible Impeller Pump with remote control. Bought brand new, stored but not yet needed. Please research this pump. Bought for $4,000. 60x60 Plate & Frame Press Filter: Make Schenk. Frame material is stainless steel. Number of polypro plates 48 + 2 stainless steel end plates. Hydraulics do not work, but manual operation works. Comes with box of spare parts. Floor space 118" L, 43" H and 36" W.
We have a gently used Lentina Plate filter for sale. Built in 2015, used approximately 5 times total. Please note tightener has 2 handles and clearly works great. Holds 22 filter sheets. Beco filter pads for plate and frame filter. Sized 400x400 mm pore sizes 350, 450, and 550 550 - 175 sheets for 175$ 450 - 75 sheets for 75$ 350 - 100 sheets for 100$ There are also a few opened packs that I will throw in for free. 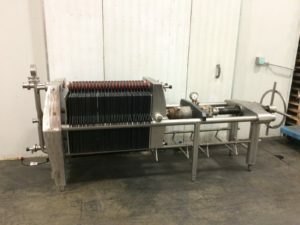 We are selling our AlphaFilter 40x40 plate & frame filtration unit we bought in the fall of 2017. We used it once, then decided to stick with crossflow filtration. The details are attached as an image, but it's a 40x40 w/40 plates and has the double filtration kit with it. This also comes with filtration pads, see pics for details. Buyer arranges freight and we can assist in prepping it and getting is securely on a pallet. We can deliver, if local (< 100 miles). Two DE filters for sale. One 2m velo and one 5m Spadoni. Both worked when put away, but it has been a few years since their operation. 5m Spadoni easily handled 60bbl/day before we switched to a centrifuge. 2m Velo has an erosion tank. See photos for more details. Asking $1500 for Velo and $3,00o for Spadoni, OBO. Shipping extra. Ships from Halifax, NS, Canada. Feel free to email for more info. 1.5 hsp, 1 1/2 in. T.C ports, single phase stainless pump and motor for sale. Asking $1,000 or best offer. For sale is a high quality used 316 polished stainless filter housing that holds 20 of the 30" long Code 7 cartridges. 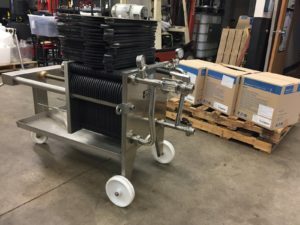 This would make a great inline sterile filter for a bottling or kegging line, a polishing filter after DE, or a standalone rough filter for the sour beers you don't want to send through your normal filtration equipment. This filter would be around $8K brand new. The filter has a excellent stainless stand with casters so it can be rolled easily as well. I can pack the filter in a crate and help arrange shipping.